What Should You Focus on To Stay in The Zone? 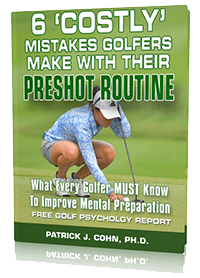 Dr. Patrick Cohn, golf psychology expert and author of the “Golfer’s Mental Edge” CD program and Breaking The Yips Cycle DVD program, teaches amateur to tour professional golfers how to improve their mental game of golf using golf psychology strategies developed over the last 20 years of his career. When playing well, do you tend to take yourself out of the zone? 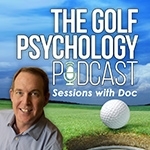 In this week’s golf psychology session, mental game of golf expert and author of The Mental Game of Golf, Dr. Cohn, responds to a question from Tom. Tom tends to jerk himself out of the zone when he is playing well. COHN: The first one would be focusing too much on results or outcome. In other words, getting ahead of yourself and then the other one maybe a little bit of comfort zone twist thrown in there as well. COHN: It is very easy for golfers to jerk themselves out of the zone. COHN: When you are playing well and you are in the zone, you’re just playing one hole, one shot at a time and your doing your nest to focus only on that. COHN: When you get into a position to win or you get a good round going, maybe a career round, and you realize that, you start to judge how you are playing. COHN: That is when havoc can start because as soon as you start judging that you’re doing well in that moment, that’s where you can start to jerk yourself out of what you’re doing. 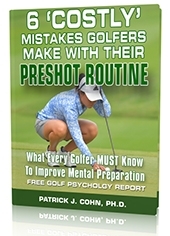 Are you making any “costly” mental game mistakes during your pre-shot routine? Why your pre-shot routine should match your personality. How to develop a focused and consistent pre-shot routine to execute your best shot. The top mental game strategies your pre-shot routine must include.